I recently mentioned David Beckworth’s excellent new paper on inflation targeting, which, according to him, promotes financial instability by inadequately responding to supply shocks. Like free bankers and some other economists, Beckworth understands the effects of productivity growth on prices and the distorting economic effects of inflation targeting in a period of productivity improvements. 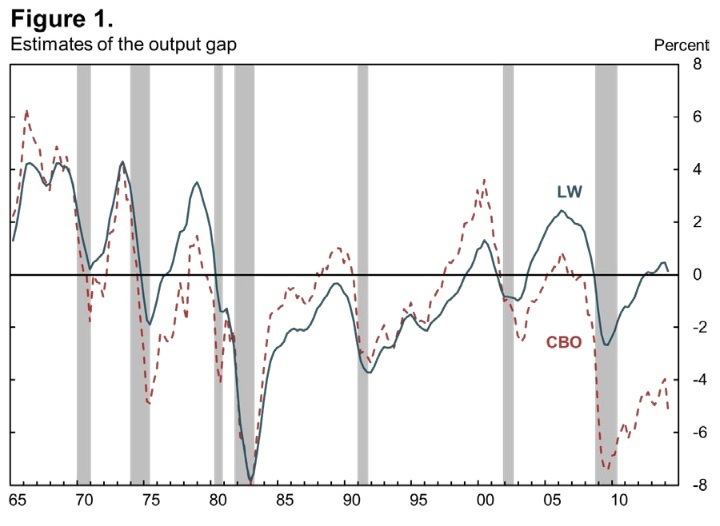 Nevertheless, I am a left a little surprised by a few of his claims (on his blog), some of which seem to be in contradiction with his paper: according to him, current US output gap demonstrates that the nominal natural rate of interest has been negative for a while. Consequently, the current Fed rate isn’t too low and raising it would be premature. While I believe that the real natural interest rate (in terms of money) is very unlikely to ever be negative (though some dispute this), it is theoretically and empirically unclear whether or not the nominal natural rate could fall in negative territory, especially for such a long time. 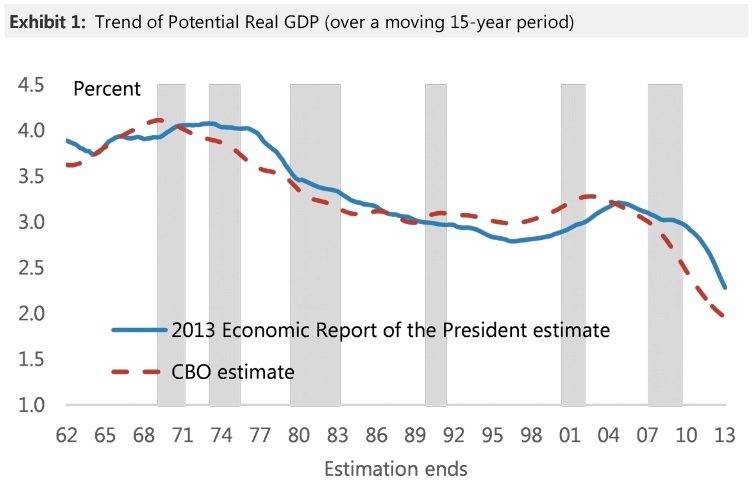 Beckworth uses a measure of US output gap calculated by the CBO and derived from their potential GDP estimate. This is where I become very sceptical. GDP itself is already subject to calculation errors and multiple revisions. Furthermore, there are so many variables and methodologies involved in calculating ‘potential’ GDP, that any output gap estimate takes the risk of being meaningless due to extreme inaccuracy, if not completely flawed or misleading. Wait a minute. For most of the economic bubble of the 2000s, the US was below potential? This estimate seems to believe that credit-fuelled pre-crisis years were merely in line with ‘potential’. This is hardly believable, and this reminds me of the justification used by many Keynesian economists: we should have used more fiscal stimulus as we are below ‘trend’ (‘trend’ being calculated from 2007 of course, as if the bubble years had never happened). Does this also mean that the natural rate of interest has been negative or close to zero since 2001? This seems to contradict Beckworth’s own inflation targeting article, in which he says that the Fed rate was likely too low during the period. Some of the methodologies used to calculate some of those estimates might well be inaccurate, or simply wrong. Still, this clearly shows how hard it is to determine potential GDP and thus the output gap. Any conclusion or recommendation based on such dataset seems to me to reflect conjectures more than evidences. This is where we get to my point. the productivity gains will also create deflationary pressures that an inflation-targeting central bank will try to offset. To do that, the central bank will have to lower its target interest rate even though the natural interest rate is going up. Monetary authorities, therefore, will be pushing short-term interest rates below the stable, market-clearing level. To the extent this interest rate gap is expected to persist, long-term interest rates will also be pushed below their natural rate level. These developments mean firms will see an inordinately low cost of capital, investors will see great arbitrage opportunities, and households will be incentivized to take on more debt. This opens the door for unwarranted capital accumulation, excessive reaching for yield, too much leverage, soaring asset prices, and ultimately a buildup of financial imbalances. By trying to promote price stability, then, the central bank will be fostering financial instability. I am asking here how much trust we should place in some potentially very inaccurate estimates. Perhaps the risk-aversion suppression and search for yield of the system is not apparent to everyone, including Beckworth, not helping him diagnose our current excesses. But, his ‘indicators that don’t show asset price froth’ are arguable: the risk premium between Baa-rated yields and Treasuries are ‘elevated’ due to QE pushing yields on Treasuries lower, and it doesn’t mean much that households still hold more liquid assets than in the financial boom years of 1990-2007. At the end of the day, we should perhaps start relying on actual** – rather than estimated and potentially flawed – indicators for policy-making purposes (that is, as long as discretion is in place). 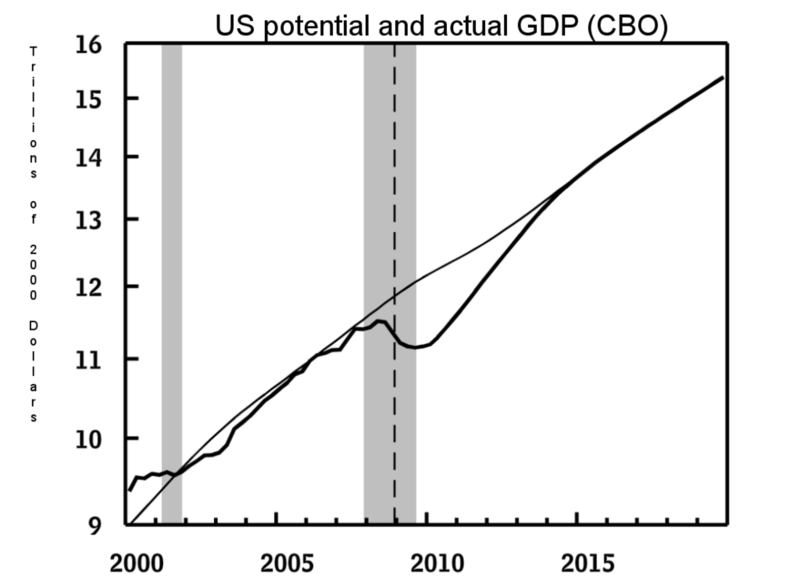 Had US GDP been considered as above potential in the pre-crisis years and the Fed stance adapted as a result, the impact of the financial crisis might have been far less devastating. I agree with Beckworth: time to end inflation targeting. ** I understand and agree that ‘actual’ market and economic data can also be subject to interpretation. I believe, however, that the range of interpretations is narrower: these datasets represents more ‘crude’ or ‘hard’ data that haven’t been digested through multiple, potentially biased, statistical computations.